New Tygart Flyer – A very comfortable, climate-controlled excursion that features two separate mountain grades, an “S” curve tunnel, passage into a 1,500 feet deep canyon with steep, densely forested slopes, and a high bridge over the meandering Shavers Fork of the Cheat River. 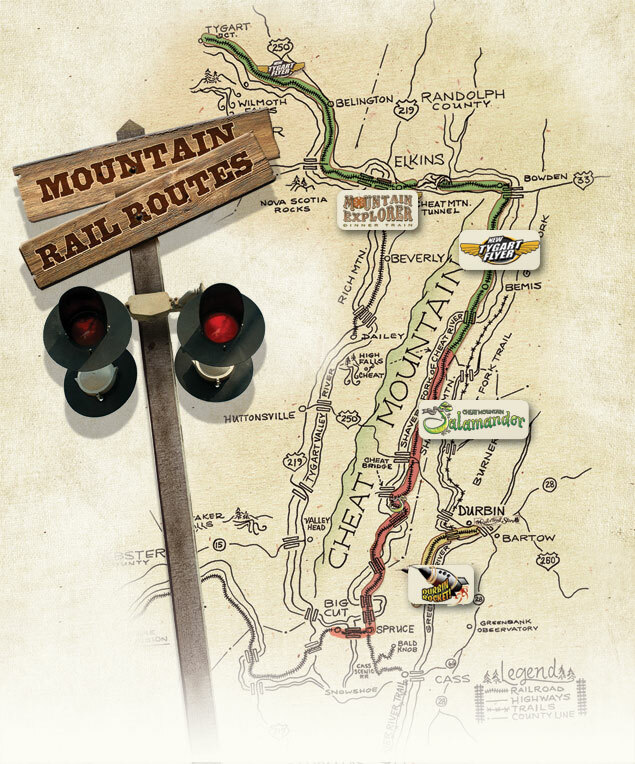 Mountain Explorer Dinner Train – a 4-hoour, round trip excursion through scenic West Virginia backcountry to the High Falls of Cheat. A four course meal prepared en-route is served throughout the trip. This is a unique and memorable evening! Durbin Rocket – Train is powered by a very rare steam locomotive – Old #3, one of only three operating Climax geared logging locomotives on earth! Castaway Caboose – overnight package includes a round-trip fare on the DURBIN ROCKET steam train ride, where you will be “cast away” at one of two remote settings. The Cass Scenic Railroad is the same line built in 1901 to haul lumber to the mill in Cass. Cass is the home to the world’s largest fleet of geared Shay locomotives. Six Shays, one Heisler and one Climax reside here. A steam engine trip takes you to Whittaker Station or Bald Knob.